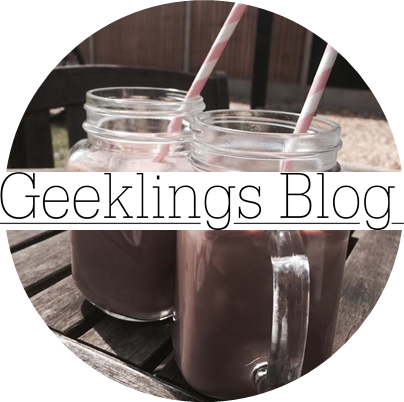 Geeklings Blog x: A Dismal Day! If you live outside the UK then I'm not sure whether you are aware of the 'Dismaland' attraction, or whether it's been televises and talked about as much as it has in this country but if you live in the UK, especially England you will most likely have heard about the latest Banksy (and other guest street artists/ artists) exhibition which is being held for 5 weeks in Weston-Super-Mare. If you read one of my earlier posts about my top 5 favourite artists, link here, then you will know that Banksy is one of them and so when I saw it being covered on the news I immediately started googling it. 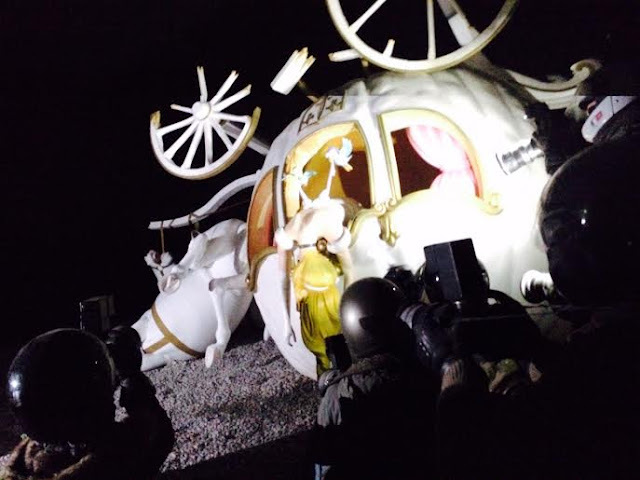 It is called Dismaland and it has kicked up a storm in the media over here already even though it only opened three days ago. 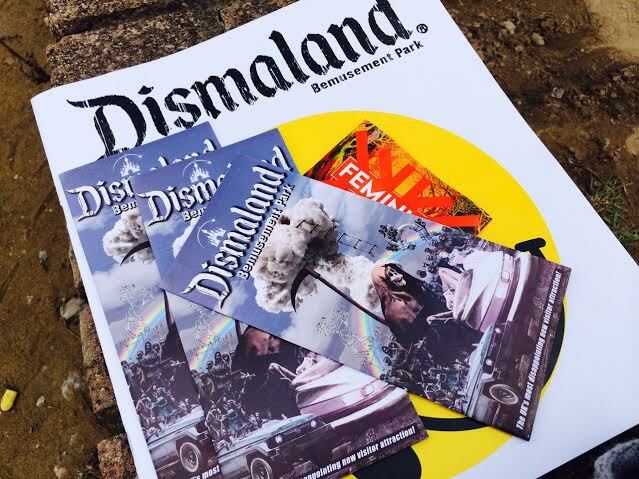 It is Banksy's take on theme parks and amusement parks across the world, and featured a lot of his and other artists work, nearly all of them having some sort of meaning or political message behind them, but I'll get on to that a bit later in the post. 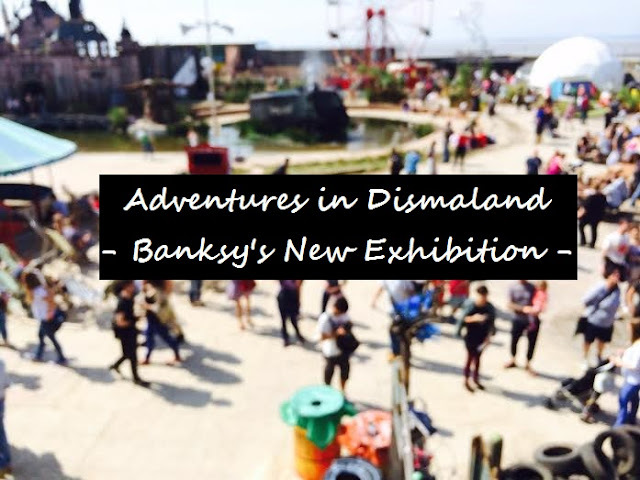 It's called Dismaland because the staff and 'attractions' are very gloomy and forlorn and a lot of the work that's in there kind of adds to the effect of that. Anyway I thought you'd like to hear or look into it more (I know there is some mystery about what the experience is like etc.) incase you are thinking about going or you are an art or Banksy lover like myself. 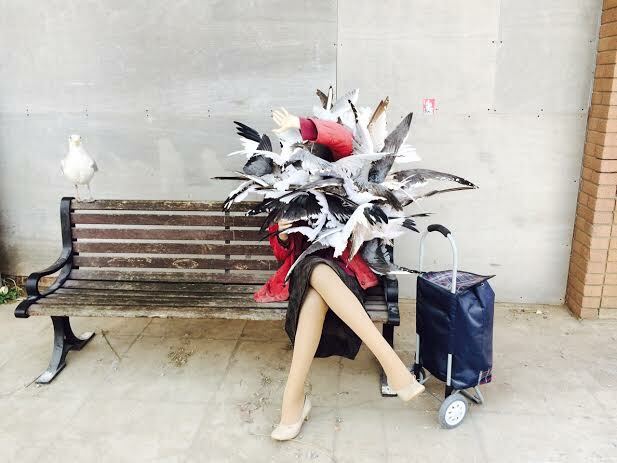 As me and my family aren't local to Weston-Super-Mare at all, we first attempted getting tickets on the Dismaland website, so that we had we had a guaranteed entry without worrying about queueing with a chance we might not get in, as they only accept the first 2,000 in the queue and after that entry is on a one-in-one-out basis. However the website kept going down (6,000,000 people tried to access it each day so no wonder!) and then they finally took the ticket page off the website and declared that on Saturday and Sunday you couldn't get tickets you just had to queue for them- and if you were travelling from far away you had to take the risk. So we did! And luckily for us, it paid off and we got in smoothly! A little word of warning, though, if you are thinking about going you have to be prepared to queue for a long time. We arrived to Weston-Super-Mare at about 8 or 8:30 and there were about 200 people infront of us. 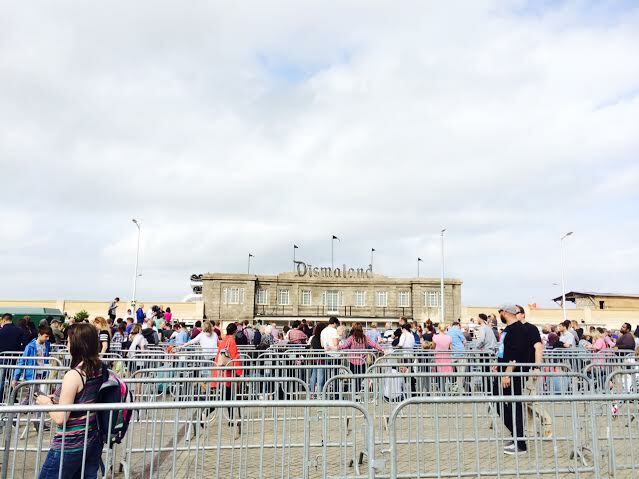 We then queued for about 2 hours to get tickets and then a further hour and a half for them to open the doors and then for the groups of people to be let in at around 10 at a time. We made the mistake of not bringing any camping chairs, foldable seats, food, coffee, water or anything like that and we hadn't had any breakfast. But when we got in, it was worth it. Just be prepared! You then pass through a comic book-like security room, where you get told to look into a cardboard CCTV camera and metal detector and finally get checked by another lackadaisical member of staff. Once again, I couldn't contain my laughter when they were asking me questions to see whether I was dangerous or not! After that, you go through the doors and the first thing I noticed was the creepy, slow paced music which blared out through old fashioned speakers, and continuously played throughout the whole day, with occasional interruptions from a girl with an eerily sweet voice making political/ scary statements. I can't remember any off the top of my head but I think you get the picture. 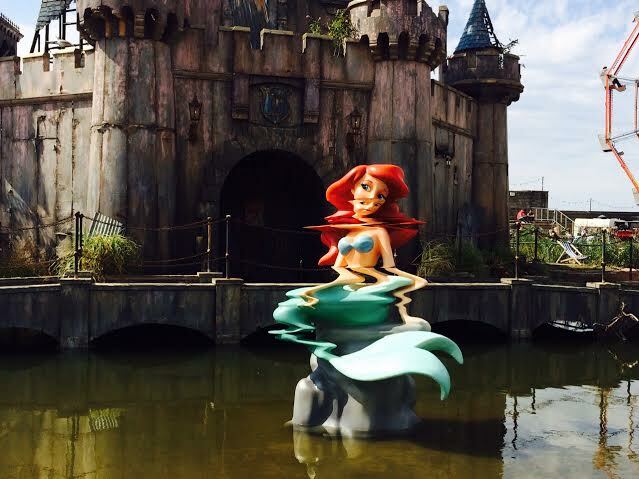 One of the main sculptures/ installations/ pieces of art that you see as you go around like you would a normal theme park, is this mermaid, Ariel. Except a distorted and warped version of her, and I have to say that this was my favourite piece by Banksy in the whole thing (I think he did 7 pieces in all). I'm not really sure why- I just think it is original and effective and when I think about it, it must have been incredibly hard to make and then paint whilst keeping it realistic. This is in a big lake in front of a burnt, ash grey and brown kind of Disney castle in the centre of the park, and is one of the first things you see when you walk in. 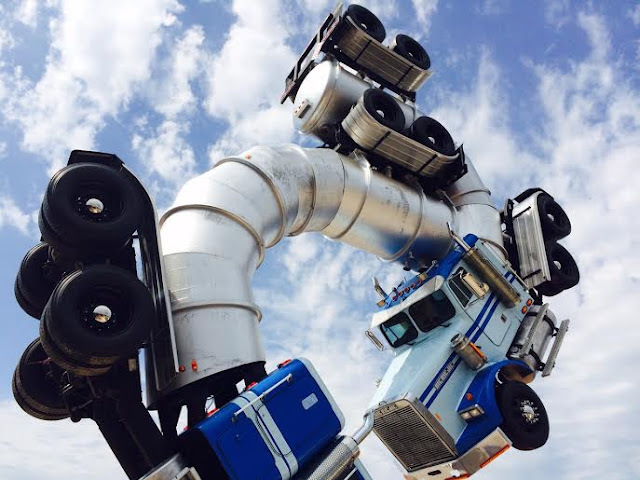 If you were wondering whether there were any actual fairgroud rides (even though they aren't really the point of the whole place, but you might be interested!) then the answer would be yes. 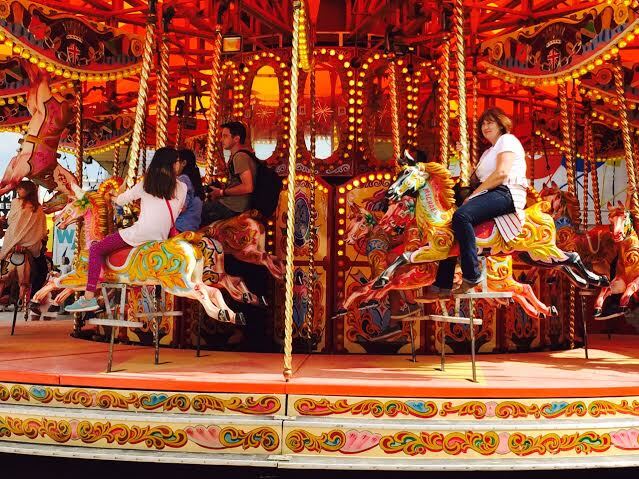 There were 2; a carousel which went round quite a bit faster than a normal one should, and a huge Ferris wheel which once again goes faster than one normally should. The carousel above had a plastic dummy in a white lab suit and mask in though to represent the horse meat scandal, as well as a few horses hung up from the top of the ride, which I've only just noticed looking back at the photos I took, once again to represent the horse meat scandal. You walk through a pitch black corridor which winds around and takes you to the above display: Cinderella draped, lifeless, across a life-size carriage. The crash is surrounded by model photographers, all frantically taking photos (represented by the repeated flashing, so definitely don't go in if you are sensitive to strobe lights or get affected by it). The piece was mesmerising, because it was like looking on something frozen in time. I overheard a woman near me saying it was an interpretation of the car crash that princess Diana sadly died in, and the way that media reacted. Getting the story first, not help? The Big Rig Jig was colossal! 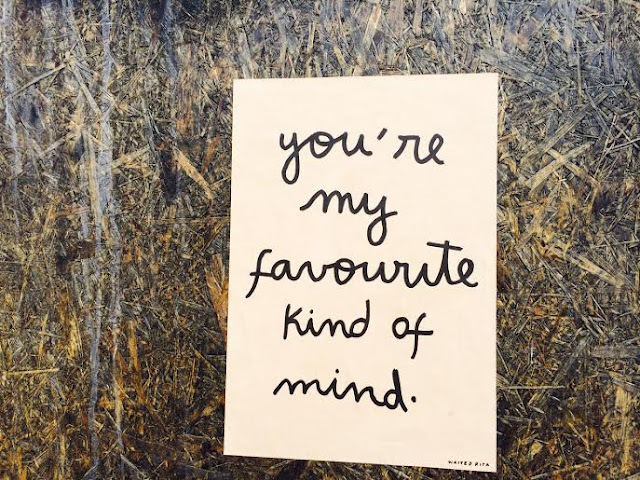 I loved the wall of simple but thought-provoking poster quotes. One of my favourites is above! Seagulls are dangerous! Behind the bench is a large part of the park, which is a darkly lit gallery of all the artists work, including a mushroom cloud treehouse, an amazing changing animation and finally a spectacular mini model display of a town after a riot, it must have took years to finish because the models were so detailed, and there were so many police cars and about 100 flashing lights for their sirens. 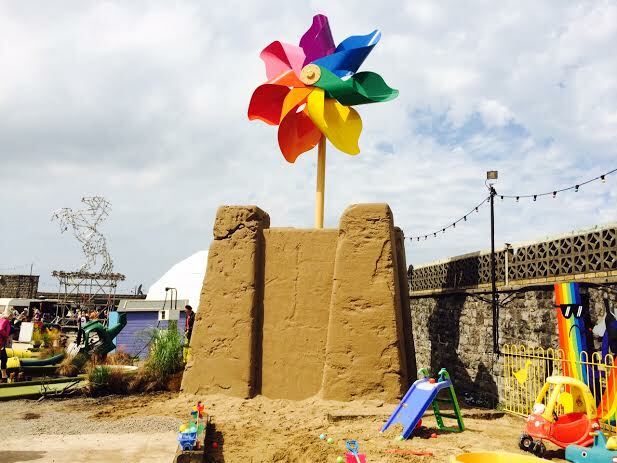 A ginormous sandcastle and run down childrens play area. What I found interesting was that children playing in it did not care at all about what state it was in... I don't really know what point I'm trying to make , it just made me think about the difference between childhood and adulthood. 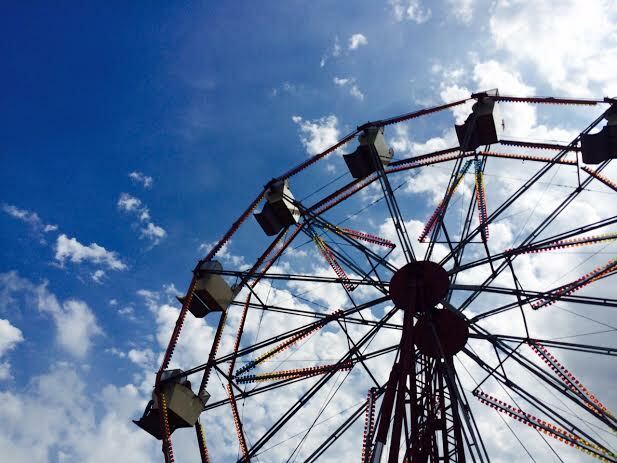 The Ferris wheel I mentioned earlier. 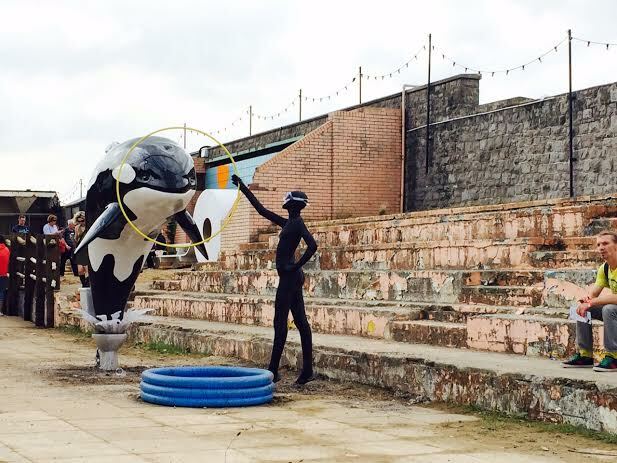 An installation to make a point about the conditions and life of some show whales. Behind the wall in the background was a toilet paper bench XD and a small cinema screen which played several short animations or films. There were two I really loved; some giraffes doing Tom Daley style diving, and then a girl and a boy seemlessly growing from babies to death, all captured through short clips. And that's all I got up to! Thouroughly recommend it to anyone thinking about going, just get their fairly early and keep the mantra of 'it'll be worth it when I get in' in your head whilst queuing, because it definitely will be. Only £3 entrance fee as well, which I also think was making a point. This looks like one of the most amazing places to visit.